Decisions on redistribution will be taken collectively as a nation and will not undermine the economy or food production, Jessie Duarte says. 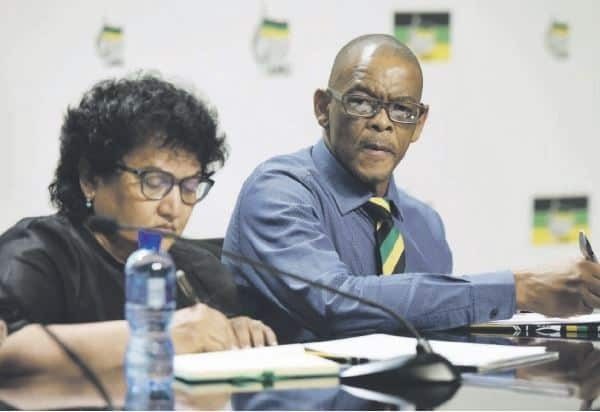 During an ANC media briefing on the recent cabinet reshuffle, several ANC leaders provided comment, certainty and a way forward with regards to the expropriation of land without compensation policy. Secretary-general Ace Magashule said the review and amendment of Section 25 of the Constitution will grant government legal means to ensure that people share in the country’s wealth and that the land shall be shared among those who work it, as stipulated in the Freedom Charter. He said the party reaffirms the policy must be executed in an orderly manner and that illegal occupiers of land should face the law. Magushule said the land reform programme must have clear targets and time frames. It should be guided by the principles of the law and the economy, and contribute to job creation and the country’s investment targets. ANC head of elections Fikile Mbalula said the positive vote for the motion on land expropriation without compensation is a victory for South Africans and that it was a political milestone that saw like-minded political parties voting in favour of the policy. He said the findings by the land audit were a clear indication that land reform has not been a success. “Radical economic transformation means speeding up, among other things, land redistribution,” Mbalula said. He added that the ANC did have a moral claim to advancing the policy and that it was a tactical matter with regards to which political party tabled the motion and claims the victory. He said in the previous year the matter had been about expropriating without compensation land belonging to the government, and had the party’s conference taken a resolution on the matter by that time it would have voted with the EFF. “It is our conference resolution and that is what is important… it is a victory to the people of South Africa and the dispossessed,” he said. Mbalula said once the policy has gone through the Constitutional Review Committee it will be implemented. “We have been here before at a point where we spoke willing seller, willing buyer. Now we are at the point where we accelerate,” he said. ANC deputy secretary general Jessie Duarte said the panic around the policy is uncalled for, reassuring citizens that South Africa will not be another Zimbabwe. She said there is land use plan in the making, and that redistribution will not be a decision taken by the ANC alone but collectively as a nation. Duarte said every South African committed to the prosperity of the country will work with the organisation in its efforts of implementing the policy and avoid starting unintended panics. She said the ANC’s land use policy will not undermine the country’s economy and food production, adding that she doubts people will lose property such as houses due to the implementation of the policy. Responding to a question whether the ANC would consider entering into a coalition with the EFF, Dakota Legoete said it is in the interest of the ANC to maintain working relations with opposition parties so as to build a better country through improved service delivery. He said the ANC will humble itself before the people and work on regaining lost ground. Magashule said with regards to the policy’s implementation, no decision has been taken on the Ingonyama Trust but said the kings, chiefs and affected communities will be consulted.